Compact domestic wastewater treatment systems for 5 m3- 2000 m3/day capacity range for 25 - 10.000 person capacity equivalent. Land based compact treatment systems for permanent & temporary residences and camps. Thanks to the full automation system offering installation and operation convenience for all facilities and premises that need to use irrigation water in the discharge of household wastewaters and that require a treatmentplant due to environmental or legal requirements, these are portable and cost-effective systems ensuring seamlessoperation for years. Entirely prefabricated, the compact treatment units are of portable sizes and aesthetical appearance. Compact Treatment Units are manufactured of carbon steel formed at appropriate thickness, and surfaces are finished with two coats of mastic epoxy paint after sandblasting process to provide anticorrosive effect. Even in variable wastewater capacities, the system is capable of yielding output water conforming to the Standard Values for Discharge of Household Wastes to the Receiving Medium under the “Regulation Governing the Control of Water Pollution”. The output water of the compact treatment plant may be used for the irrigation of gardens. The Compact Treatment - Plant treats wastewaters by a Biologic System employing a microorganism community called active smudge. 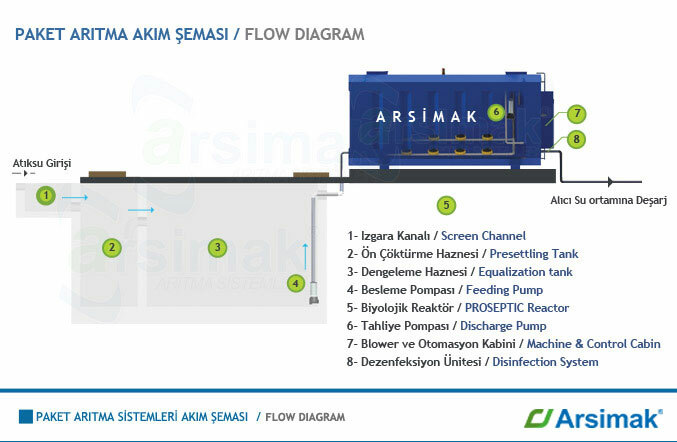 As excess process smudge to be produced in the compact treatment unit is mineralized, it may be sucked by means of a sewage truck at 4-5 month intervals based upon the pollution rate of the input water or employed as a fertilizer in case the medium allows. Compact treatment units - plants are covered under service and maintenance warranty. Our company provides replacement parts and technical service for the subsequent years.